There are the original parents of the family; Frank Buckman (Jason Robards) and his wife Marilyn (Eileen Ryan) (oh, and one of their mothers is still around, played by the delightful Helen Shaw). 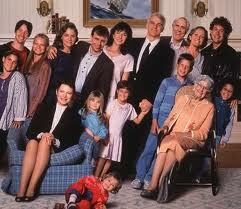 They have four kids; Gil (Steve Martin), Helen (Diane Wiest), Susan (Harley Jane Kozak) and Larry (Tom Hulce). Gil, married to Karen (Mary Steenburgen) is dealing with an anxious son, a quite normal daughter and a crazy toddler and is trying to figure out how he feels about the fourth which is on the way. Helen has a son, Garry (Joaquin Phoenix) who is reclusive since his father left and a rebellious daughter, Julie (Martha Plimpton) who is dating drag- racing drop-kick Tod (Keanu Reeves). Susan is married to Nathan (Rick Moranis) who is desperate to ensure their daughter is a genius. And Larry turns up out of the blue being chased by gangsters who owe him money and with a surprise son, Cool, in tow. A lot going on? Yup. Funny? Very. Heartbreaking? Yes, at times. Does it stand up to time? I think so. Some of the fashions are dated, but not in a bad way. I’d be interested to see how much would change if such a film were made now. Possible not a lot. It’s clever, entertaining and I totally enjoy it every time I see it. Parenthood was nominated for Oscars for Best Actress in a Supporting Role (Dianne Wiest) and Best Music, Original Song (Randy Newman, I Love to See You Smile).